The World Bank has recently published the report “High and Dry: climate change, water and the economy”, where an overview of the future development of the water supply sector is provided. Unsurprisingly, the report declares that our actual economic development rate is incompatible with a sustainable allocation of natural resources, water supply above all. Growing populations, expanding cities and the resulting climate change will converge upon a world where the demand of water will rise exponentially. Since our development policies are not designed for an efficient management of water, the future ahead the world will have to face water scarcity with a reduction of two thirds by 2050, with all its consequences in agriculture, sanitation and economy. Which future for our economy? “Economic growth is a surprisingly thirsty business”, the report declares. The diminishing water supply will lead to a reduction of productivity in agriculture, producing goods will become less efficient and more expensive, with a result of losses in GDP of about 6%. 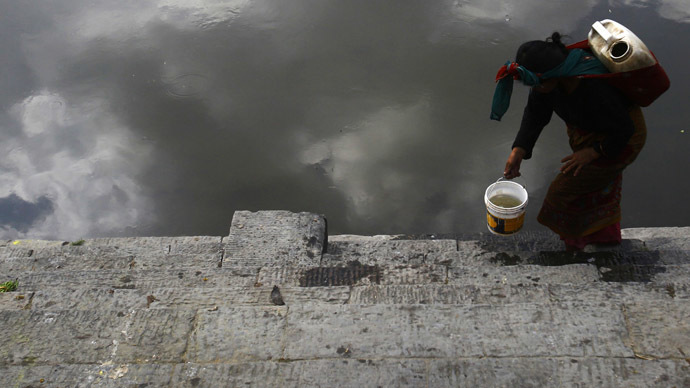 Bad water management will lead to a waste of water in sanitation, healthcare and food security. Furthermore, because of climate change rainfall has become less predictable and common, with a dramatic increase of desertification. The portion of the population which will be most affected will be the poorest, due to their reliance on subsistence agriculture. In low-income countries girls and women still walk an average of six kilometres every day to reach the principal water source, which is time that they could have spent going to work or attending school, and the lack of proper sanitation and infrastructure in villages leads to consistent waste of water for bathing, cooking and agriculture. This trend in low income countries means that most of this natural resource is completely wasted and not invested in higher productive activities. The continuous waste of time for accessing water, the diseases related to clean water scarcity has, not surprisingly, an adverse impact on the economic growth of a nation; people are fully involved in surviving rather than improving their living conditions. Water scarcity and drought can cause famine and a lack of food. This could exacerbate the migration processes that are already in progress, leading to a worsened humanitarian and refugee crisis. Water scarcity leads to political instability and can be an inner root for internal war. In African low-income countries such as Congo, the lack of proper water sources and sanitation forces women and girls who need to acquire water to walk across the forest each day. This is not only an improper use of their time, as they are not allowed to attend school or work, but often forests and territories around wells are controlled by military rebels or troops, which can be a menace for the safety of these girls, with an increase in rapes, murdering and kidnapping. Efficient policies in water management can lead to a solution. If economy is commonly defined as the “science of scarcity”, its work must deal with future scarcity of such important resources. The World Bank suggests that possible solutions should come from both public and private sector; concerning the private sector, investment in innovative technologies often rely on private investment, and should be granted better promotion and funding of innovative water saving ideas. Concerning public policy, the government should improve sensitisation campaigns and reduce water wasting, and fund and promote water-saving technologies and ideas. Some solutions are already available in agriculture, such as the Climate Smart Agriculture, which helps farmers in low-income countries. Furthermore, governments across the world should provide better infrastructure for proper access to water and sanitation; even this solution is considered expensive and impossible to reach in just few years. It should be considered that granting access to water can help the resilience of a country and benefit its economy. The World Bank report suggests that better water access improves the national economy by 6%, the same 6% we could lose in GDP if we don’t intervene. Djafarova Leyla Aydin qizi is from Tashkent, Uzbekistan, and recently graduated from Otto-von-Guericke University of Magdeburg, Master’s Program Peace and Conflict Studies.